Fair. 0679642609 Ships promptly from Texas. Very Good. 0812968255 Minor shelf wear. In the introduction to his translation of the "Meditations" Gregory Hays observes that "[I]t has been a generation since [The Meditations'] last English incarnation." 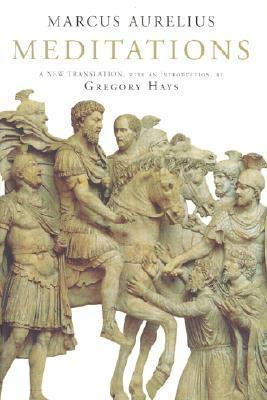 Hays further explains that he has attempted to present a readable, modern translation of Marcus' great work which still captures the "patchwork character of the original." I find that Hays's translation succeeds. He translates Marcus's reflections into a colloquial, frequently earthy, English in unstilted language and idiom that will be familiar to a modern reader. I think the translation is as well faithful to Marcus's thought. The reflective, meditative character of the paragraphs come through well, as does the difficulty of the text in many places. This is a book that will encourage the modern reader to approach Marcus -- an altogether commendable result. Professor Hays has written an excellent introduction to his translation which can be read with benefit by those coming to the "Meditations" for the first time and by those familiar with the work. There is a brief discussion of Marcus's life, his philosophical studies, and his tenure as emperor of Rome (161-180 A.D.) Hays spends more time on the philosophical background of Marcus's thought emphasizing ancient stoicism and of the philosophy of Heraclitus. He discusses the concept of "logos", a critical term for Marcus and for later thought, and argues that logos -- or the common reason that pervades man and the universe -- is as much a process as it is a substance. This is difficult, but insightful. Hays discusses briefly the reception of the Meditations over the centuries. I enjoyed in particular his comments on essays by Arnold and Brodsky on Marcus Aurelius. The Meditations is one of the great book of the West and will repay repeated readings. When I read it this time, I was struck by Marcus's devotion to his duties in life as the Roman emperor. I got the distinct impression that Marcus would have rather been at his studies but kept telling himself, in his writings, that he had to persevere and be the person he was meant to be. It is a focused approach, to say the least, to the duties to which one was called. I was also impressed with the similarities at certain points between Marcus's thought and Buddhism. Other reviewers have also noted this similarity. Marcus talks repeatedly about the changing, impermanent character of human life and about the pervasive character of human suffering. He talks about controlling and ending suffering by understanding its causes and then changing one's life accordingly. There is a need to learn patience and to control anger and desire. More specifically, Marcus' understanding of perception and how it leads to desire and can be controlled by reason (discussed well in Hays's introduction.) is very Buddhist in tone. I have become interested in Buddhism and was struck in this reading of the Meditations by the parallels it offers to Buddhist thought. There is a wonderful paragraph in the Meditations where Marcus urges himself to persevere and not to lose hope simply because he did not become a scholar or a hero or the person of his dreams. What matters is being a good person and living in harmony with one's nature. This passage spoke clearly and poignantly to me as I reread the Meditations. Undoubtedly, the reader will find passages in this book that are addressed clearly to him or her. This is a book that should be read and pondered many times. Hays and the Modern Library have done readers a service with this translation.